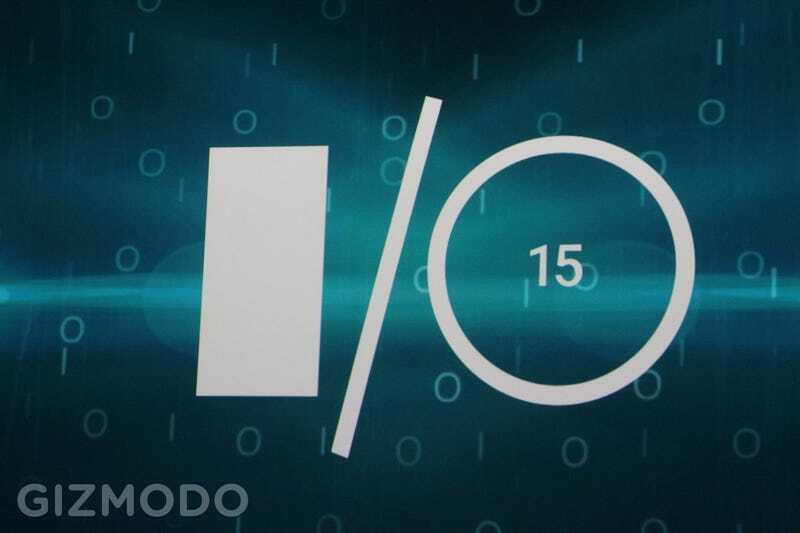 Today is the first day of Google I/O, the company’s annual conference where they announce what’s coming in the next year. We’re here at the keynote, and we’ll be liveblogging it for you, starting now. Keep hitting refresh to get the latest updates! Sundar’s back on stage to talk about all of Google’s moonshots, reminding us about the crazy things Google is funding. Like the self-driving car, or those Project Loon balloons, which can now deliver 10Mbps connections from the sky. Our third and final Google VR announcement: Jump. It’s a process Google created to recreate moments, places, so you can revisit them again and again from anywhere. It uses 16 cameras. Okay, now Google’s going all Magic School Bus: Google Expeditions. It’s an entire complete packaged school field trip in virtual reality. They send these kits to schools, and the entire class can have asynchronized tour. As soon as the teacher hits the button, they all join together. “We could see the place so we could actually understand what she was talking about,” says one student in Google’s latest inspiring video. Google’s partnering with museums and institutes to curate more experiences, and teachers can sign up now. Oh and no big deal, Cardboard now also supports iOS. Hello iPhone VR. There’s a new Google Cardboard viewer, whch supports phones up to 6 inches and has a new button. All of us are getting one here today! Clay Bavor is out, telling us about the surprise popularity of Google Cardboard: one million viewers are out in the world as of today. Sundar’s back, and so is the wraparound screen. “We’ve been thinking about how to bring the world to users in a more immersive way.” Time to talk about virtual reality! “Any Dora the Explorer fans out there?” asks Ellie. The response is hilariously weak. There’s a new family friendly category of apps, books, music, movies, and games on Google Play, with this helpful star badge to show you that it’s okay for kids. Those numbers don’t tell you whether developers are making money, but still, big numbers. In Feb, the company said devs earned $7 billion over the previous 12 months. Lots of talk here about “maximizing revenue.” Who doesn’t like money? Okay, this might have rammifications for you even if you’re not a developer. Google’s cloud messaging now suppots Android, iOS, and Chrome, so an app could send a single message to users on all platforms. Google’s also going to push universal ad campaigns across a bunch of devices as well. I think this is the third tearjerker Google video today. Little girl with disabilities. Dad’s a developer. Let’s fix it. Classic! Plus they’re here in the audience, so we know they’re real people. Okay, here are some new features for Android One that I want for my smartphone too: offline YouTube playback, offline webpages, and offline Google Maps! Just download them and use them even if you’re in a deadzone. See that little airplane mode icon? Hell, offline maps even has turn-by-turn voice directions. Now we’re talking about smartphones for the developing world: Android One. More info here. “I’m reminded of Zach, a potato farmer in Kenya whose crops were dying, and he didn’t know why,” relates our Google speaker. The farmer looked up information on the web when books weren’t available, and figured out how to stop it. That’s the audience we’re talking about for these devices. People who don’t have much connectivity, whose data speeds are low, people for whom a phone might be their only computer. People who will be very happy that Google just announced a way to make simplistic webpages use 80% fewer bytes of data. Okay, hold the phone. Photos will offer unlimited photos and videos, up to 16mp photos and 1080p videos, for free. Remember when Gmail became the defacto email app because of crazy storage and features? That may have just happened again. Google Photos is out today for Android, iOS, and web browsers. We’ll be trying it ourselves soon. Can’t lie, I’m pretty stoked. Okay this is pretty impressive: Photos recognized all the photos of this guy’s daughter since her birth... and pulled up a picture of a snowstorm he remembered from Toronto just by typing that in. Honestly, I’m not going to believe this really works for my crazy collection of photos until I try it myself. This seems way beyond our current technology! Also a little creepy. “Everything in one place, no matter what device you’re on.” It’s a chronological roll of photos organized by day... or just pinch it zoom out to your photos organized by month or year. Looks pretty great. You can also organize them by “people,” “places” and “things” without needing to painstakingly tag them all. How? Machine learning and image recognition? I think he’s about to tell us. Where else is Google applying its newfound machine learning expertise? Organizing your videos and photos. There’s a Google dad on stage joking about how he recently took hundreds of photos of a kid. Will the new Google Photos (just announced!) help him out? Let’s see. It’s about “making memories, not managing them,” says Google. Trouble pronouncing the names of potentially delicious dishes at your favorite ethnic restaurant? Get some pictures with Google Now anyhow. Just say it however you like, and Google might intelligently figure it out. A demo speaker absolutely butchered “Spanakotiropita,” but up popped pics anyhow. Impressive demo. Listening to some Skrillex, you can ask “What’s his real name?” Boom. Google replaces “him” with “skrillex” and there’s your answer. Okay, that dry cleaning reminder is pretty cool, though. It’s about context, says Google Now director Aparna Chennapragada, so it able to figure out the pronouns. What do you mean when you say “it”? Depends on the other words in your sentence, and where you are, and where you’re going. Google’s services can help with that, she says, and also help you take action on your needs. Early examples: an Uber ride when you need it. But Google wants to go further, she says: a new capability to assist you whenever you need it. It’s called Now on Tap, and it’s part of Android M.
No product announcement about this yet, but Sundar is explaining how Google’s machine learning is advancing. Neural nets that are 30 layers deep. Speech recognition accuracy getting dramatically better. It’s all about a “common language,” a “shared understanding,” says Sundar. Google will build standardized words that these devices can understand, so a smart door knows what “lock” and “unlock” mean, for example. That language is called Weave. So each new device doesn’t need to reinvent the wheel. All Android devices will recognize Brillo devices, says Sundar. Or rather, Google’s operating system for all those connected devices: Brillo. There are now 4,000 apps for Android Wear. “By the end of the year, there will be many more Android Wear watches to choose from,” Google teases. No news about Android Wear, then. The always-on screen is pretty great, and I like using the wrist gestures in the car. You can just quickly twist your wrist to flip through Google Now cards without using your hands. Lots of people are clapping for the ability to just draw emoji on the watchface to send emoji characters. I guess these are people who don’t read Gizmodo! Spot any awesome Android M features that Google didn’t talk about in this image? You’ll be able to download a preview of Android M for all the latest Nexus devices, including the Nexus Player. Android hardware is going to embrace the awesome tiny reversible USB Type-C connector! Expect your devices to charge four times faster... and even trade their charge with other devices using the same cable! Your tablet could charge your phone, or vice versa. Plus more battery life for Android devices, period, since Android devices will sync less frequently while their sleeping. Android Pay. Pay with your phone using near field communication (NFC) and host card emulation. The four major credit cards are on board, three major US carriers (no Sprint), and 7,000 retailers to start. And guess what? Android M now has standardized fingerprint support to authorize those transactions. What if you could click on a link in your web browser, and launch right into a specific part of an Android app? App links let developers build apps that can do that securely. First change: app permissions. Sounds boring, no? But it’s actually super awesome. You can actually decide which apps get access to each of your sensors and microphone on your phone. You control your privacy way, way tighter than before, instead of blindly saying “yes you can do anything you want!” to each app when you install it. Now, time to talk about the next version of Android: Android M. It’s all about quality, says Dave Burke, VP of engineering. HBO Now is coming to Android. Woo! Reiterating that Android Auto is out, and Android Wear (smartwatches) recently got a facelift. Andorid TV is getting one too. Every one of these tiny dots is a distinct Android device, says Sundar. Over 4,000 models in all. All of these Google platforms now have a billion users. Sundar is telling us how Google cares about developers, and how it built Android and Chrome to help developers build apps for the world. Because it’s a developer conference, you know! A Google Fit roller coaster just raced down a track. Not sure why! But here’s Google’s product guy Sundar Pichai to explain it all. We hope! 60 second countdown... through a cartoony mechanical contraption... and into a CG world, where whimsical representations of tech startups live in a world filled with living breathing code. “Has the acid kicked in yet?” asks Brent. Past our neighboring planets... all the way to Earth. Cheers from the crowd. Here we go! Space! Lots of stars. A barred spiral galaxy. We’re travelling straight into our own solar system. Google is really playing up the immersiveness of the stage here... there’s a giant game of pong playing on screens that wrap around the entire audience, a Rube Goldberg machine, and perhaps most telling of all—unmistakably the very same giant blue whale I had the pleasure to see in virtual reality a couple of months ago. Is Google hinting at a VR announcement? 30 minutes till showtime, and we’re stoked. You know, except for the whole “now we’re down to one and a half laptops” thing. We’ll deal. Hey guys, Brent Rose here. I’ll be your liveblog pilot for today. I’m here with Annalee and Sean, and and we’re seated and ready to go. Who’s excited? If you haven’t already read our What To Expect When You’re Expecting (Google I/O) post, now would be a lovely time to do that. The loveliest! If you’ve got questions that I can answer during downtime, tweet ‘em at me at @brentrose. Now let’s all nerd the hell out!